Easy flat non-porous surface makes it simple to clean and disinfect. 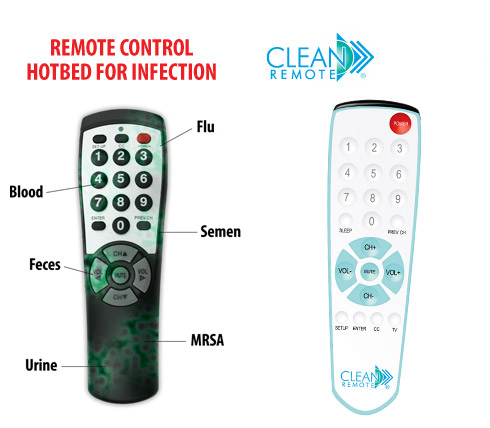 Patient Convenience - The Clean Remote offers direct channel access (numbers 1 - 9 and 0) whereas most pillow remotes have only channel up and channel down arrows, which patients cycle through all the channels to get back to a specific channel. (Note: Pillow remotes are usually part of the nurse call system, which is attached to the bed. This limits mobility and is often awkward to use). No assistance is needed in operation of the Clean Remote because of simplicity. Marketing tool - To show your facility cares about your patients. Prevents theft of batteries and lost battery covers - Hidden battery compartment and patent pending hinged battery door helps eliminate lost battery doors and deters patients from taking batteries. No menu button - Which stops the patient from changing the TV setup. Never has to be reprogrammed even if batteries are removed for extended time.